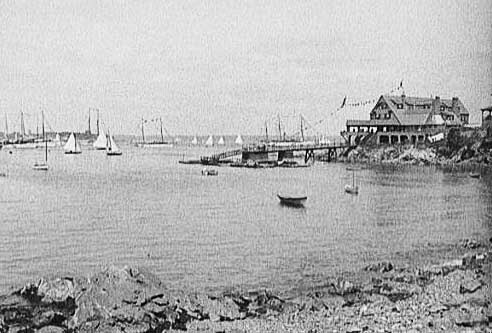 At the beginning of the 1900s, Chelsea, Massachusetts, was slowly transforming from an agricultural society to an urban and industrialized one. Industrialists needed people to work in their factories and that meant work for new immigrants like Samuel Gass. Rural Americans had left their farms to meet the demand but more labor was still needed. Immigrants, first from the British Isles, and then from southern and eastern Europe flooded Boston and other cities. Chelsea eventually became the haven for thousands of Jewish immigrants, who, like Samuel Gass, came to America to seek a new life. In 1830, Chelsea was a mere 1.5 square mile peninsula housing four farms and thirty people. 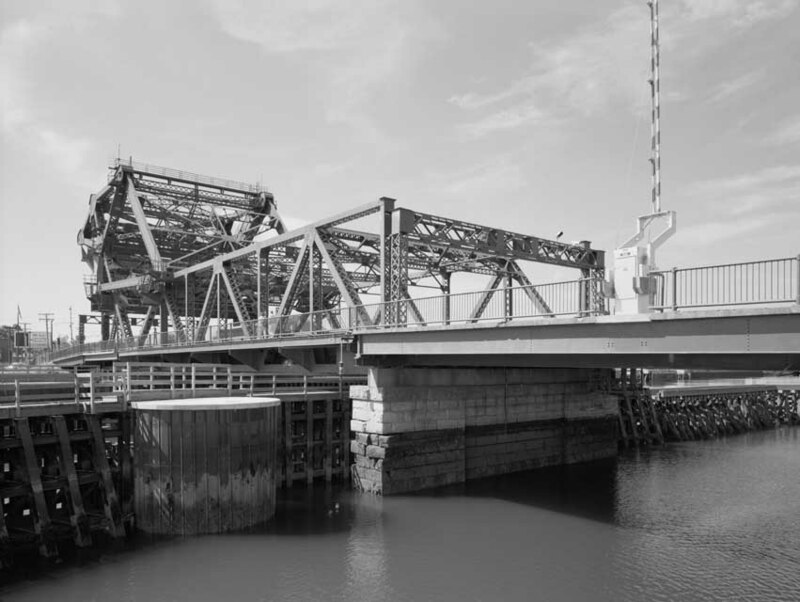 The tidal channels of the harbor, Chicken Creek and Mystic River, isolated Chelsea from Charles­town and East Boston. A creek and marshland separated it from Revere. Only with Everett did Chelsea share a dry land border. 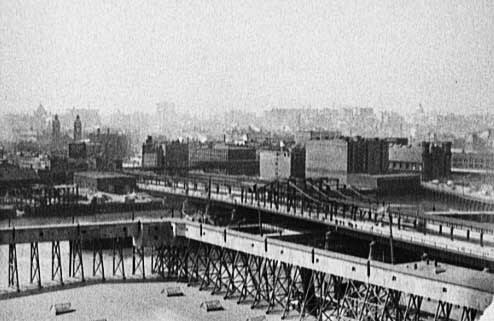 Though it was located only a mile across the harbor from Boston, Chelsea was hardly influenced by the changes that affected that metropolis because at that time no bridge connected the two locales and ferry service was nonexistent. Then in 1831, ferry service was instituted. Boston’s burgeoning, land-hungry population spilled across the harbor. By 1860, 12,000 people lived in Chelsea. The first new settlers were well-off Bostonians who built sizable homes. In 1910, almost 42% of Chelsea’s residents were foreign born, however, and intense devel­opment created a plethora of small homes on tiny lots and tenements. By 1930, once tiny, rural Chelsea was home to 45,000 people. It had become one of the most densely populated, industrialized cities in the United States. 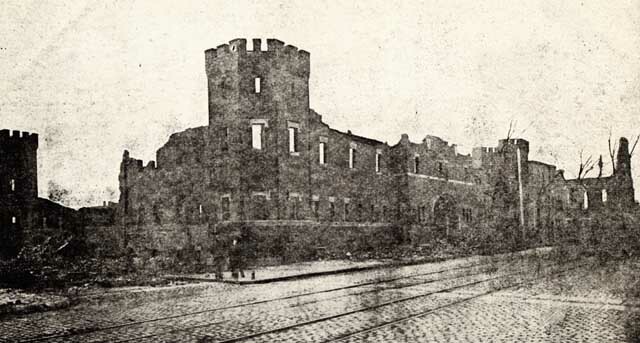 More than 100 manufacturers made Chelsea their base in 1915. Printing, leather, iron goods, food preparation, rubber hosing and belts, and a large-scale salvage industry provided a diverse economic base. Metals, old newspapers, corrugated cardboard, used clothing, wool and cotton goods, all were collected and baled into hundred-pound or fifty-pound blocks and sold to manufacturers for recycling. The city was divided into districts, segregated by class. Broadway ran the full length of Chelsea from the harbor to its border with Everett, cut­ting the city in half. The waterfront area housed the industrial and commercial core of Chelsea. Near the waterfront, tenements and a mixture of industrial and insti­tutional buildings bounded Broadway. In the midtown area, shops prevailed. Here and northeast of the industrialized area were the modest residences of many workers; beyond these were the houses of the more affluent. 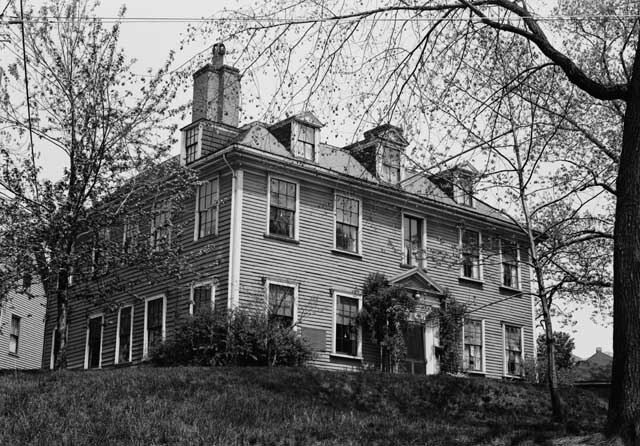 The most prestigious homes were located in Horn Hill, Mount Washington, and Mount Bellingham. 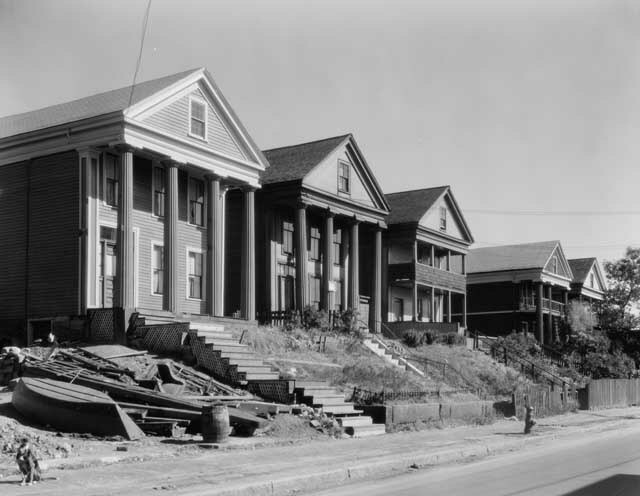 Near Mill Creek and the Everett boundary, stately homes lined the street. Most of Chelsea’s residents lived within a quarter mile of Broadway. However, lan­guage and religious differences effectively segregated the different ethnic groups. The Catholic Polish community settled near the harbor. The Jews established themselves in the mid-town area (although some streets were a mixture of Jew and Gentile.) The Protestant, American-born residents of northern European descendent laid claim to upper Broadway. Broadway in the southeast and railroad tracks in the northeast effec­tively separated their neighborhood from the Jewish section. Even the shopping dis­tricts were distinct. Along Broadway there were fourteen butcher shops belonging to Gentiles, and no Jewish butchers. On Arlington Street, there were twelve Jewish butcher shops and no Gentile butchers. The Mill Hill section and Polish section of town were very anti-Semitic. Jews felt they were locked out of certain places and certain vocations because of this prejudice. In 1905, the Jewish population of Chelsea was 4,500. 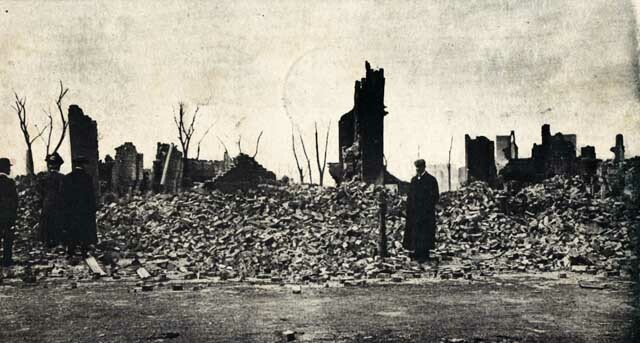 Ten years later in 1915, the population had more than doubled with 11,000 Jews in the city. Most Jews worked in relatively high status occupations. They were carpenters, tailors, clerks, bookkeepers, coal dealer, lawyers, physicians, and journalists. 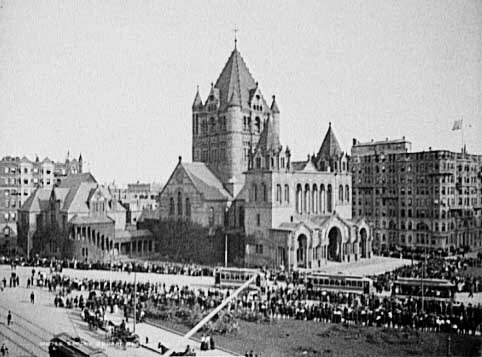 Many of the Jews moved in from Boston during the building boom that followed a terrible Chelsea fire on Palm Sunday in 1908. 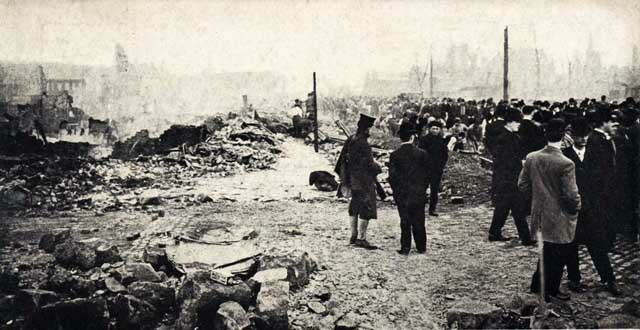 The conflagration had swept through Chelsea and destroyed almost the entire business section and many houses. 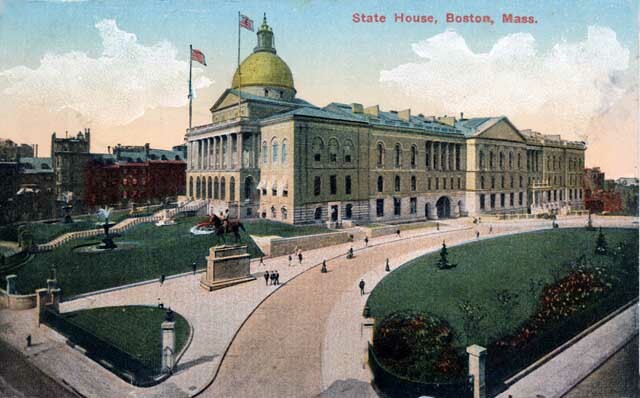 Credit: Postcard published by The Metropolitan News Company, Boston. 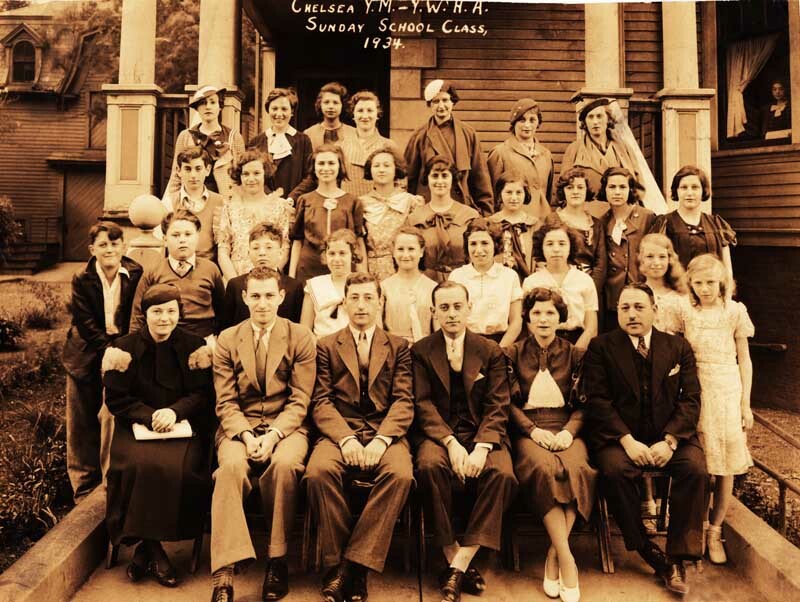 In 1915, Chelsea’s Jew population supported three synagogues and many Jewish political organi­zations such as the Chelsea Zionist Girls, Chelsea Young Zionists, Judean Juniors; two athletic associations—the Y.M.H.A. (Young Men’s Hebrew Association) and Y.W.H.A. (Young Women’s Hebrew Association); three lodges of the Independent Order of B’rith Abraham; as well as other Jewish organizations. Credit: ©1903, E. Chickering & Co. Library of Congress, Prints and Photographs Division [reproduction number: PAN US GEOG-Massachusetts no, 83]. No credit information was given on the colorized postcard image, postmarked 1914. 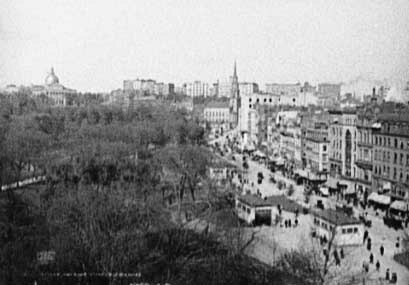 Two views of Tremont Street, alongside the Boston Common in 1903. Both look northeast and on the left are entrances to the Park Street subway station and the Park Street Church. In 1903, the Boston Red Sox, then known as the Boston Pilgrims, played against the Pittsburgh Pirates in the World Series. This photo was taken during one of the games in Boston. In 1914, the Boston Braves played the Philadelphia Athletics in the Worlds Series. This was photo was taken in Fenway Park. 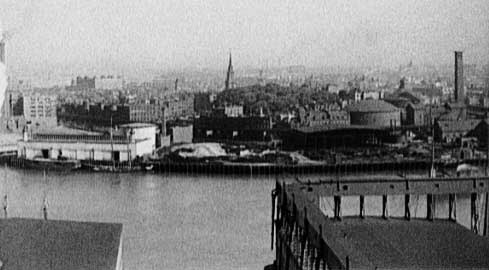 These photographs of Boston were taken from across the Charles River in Charlestown, circa 1905.